Keeps Your Feet Warm Everytime! Reliable, Comfy, Affordable & Built-To-Last! 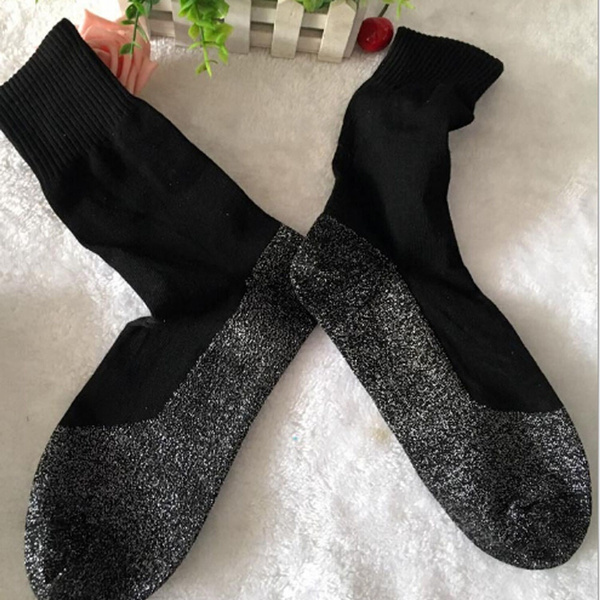 Now you can lounge around the house or get active outdoors while keeping your feet warm and dry with these 35 Below Aluminized Fiber Heat Socks. These cool socks are supersoft and made with aluminized threads woven into a breathable & nylon knit fabric. Conductive fabric technology utilizes body heat efficiently and minimizes sweat and moisture so that your feet stay warm, dry and cozy no matter the conditions. IDEAL FOR INDOORS OR OUT: Keep your feet and legs warm while indoors or outdoors with these 35 Below compression socks. These compression socks feature a lightweight and flexible material to keep you warm in the winter and cool in the summer. 2-in-1 fabric technology combines compression to aid in circulation and warmth. Ideal for working professionals that are sitting or standing on their feet all day, traveling, or people who lead active lifestyles. SUPER SOFT STRUCTURE: This pair of super soft compression socks are made with breathable, knit fabric to enhance your comfort level. The aluminized threads are woven perfectly to provide a lightweight, flexible and secure fit each time you put these black compression socks on your feet. Helps relieve swelling and discomfort from prolonged standing or sitting. 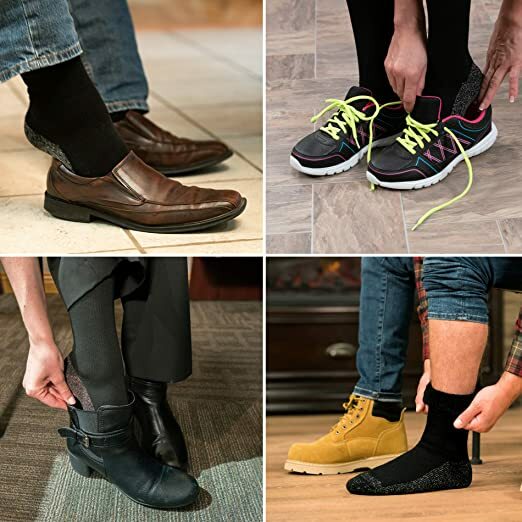 PERFECT FOR MILD TO MODERATE SWELLING: Help improve circulation and reduce mild to moderate leg swelling with these machine-washable and dryer-safe compression socks. The secure fit helps to reduce chronically tired or aching legs and helps reduce swelling when worn regularly. VERSATILE CLOTHING OPTION: There’s no need to sit at home while wearing compression socks. These cozy soft and knit compression socks are thin enough to wear underneath your regular socks, yet durable enough to wear alone. The flexible structure offers a comfortable fit and also reflects your own body heat to keep you warm in cold temperatures. SUPPORT YOU NEED: Whether your feet are aching or your legs are swelling, these black compression socks provide you with the support you need. The aluminized threads woven into the knit fabric is soft to the touch, while the secure fit offers support at 15mmHG.